Hello everyone! Meet me again! I start to write here again about what I’ve done. It just because I feel so sad when I see my page, and it’s not updated for long long time. Me my partner in Nest of Ojanto (Putri), has an idea to make some merchandises. Something we can afford to make of course. Actually we’re in our process to learn about screen printing on fabrics. Not too much, but we really fun to do that things. We did simple screen printing using stencils. So, I have big question for you. HOW ARE YOU? Haha.. :D just kidding, friends! We’re Back in 2011! Play Your Magic Hands! Oh, God! So long time I don’t write something in this blog. I just want to share something again, much more in 2011. And I think this is my first post in 2011. Hahaha (-: it’s just allright! Okey! 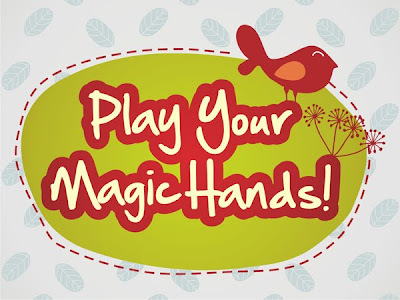 I ever wrote about Play Your Magic Hands, right? 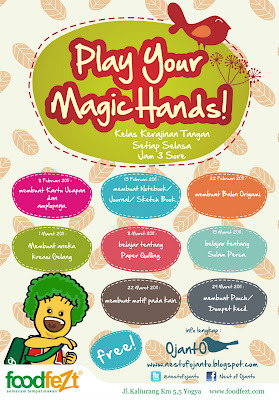 It’s a DIY (do it yourself) Project Workshop. Do you still remember! A GOODNEWS for you : we’re back in 2011! 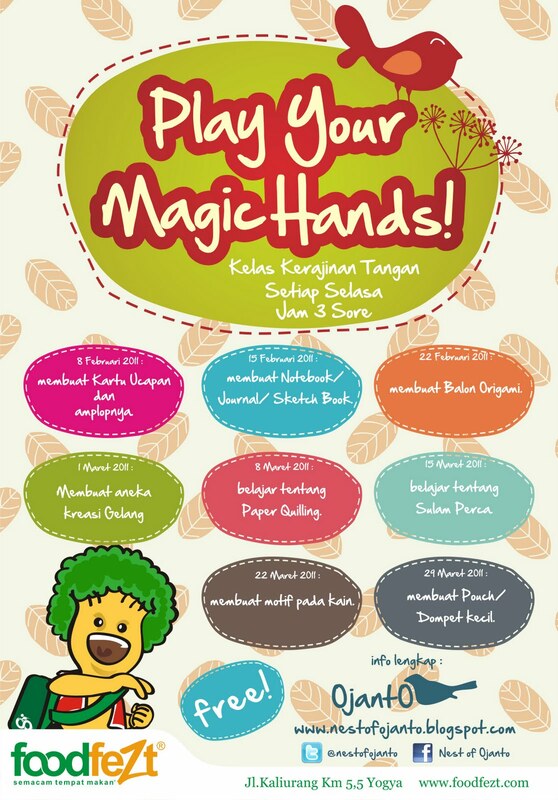 We’re gonna play together every Tuesday at 3 pm in FoodFezt Jogja!